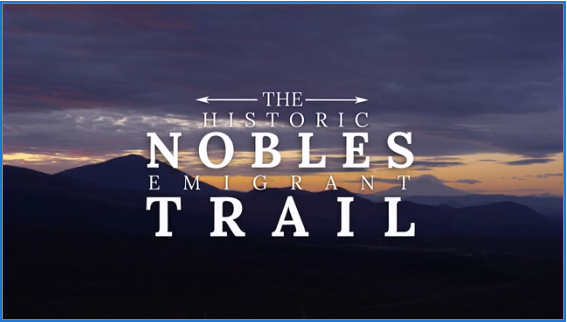 A short film about the Nobles Emigrant Trail, an important route for 19th century pioneers, is now available for public viewing, thanks to a partnership involving the Bureau of Land Management and California State University, Chico. Expert filmmakers from the Advanced Laboratory of Visual Anthropology at Chico State produced, directed and filmed the story along the trail route that crosses high desert public lands northeast of Susanville. It describes how the route alleviated some hardships that 19th century emigrants faced on other routes into California’s gold fields and farmlands. The film features interviews with BLM archaeologists and with representatives from Trails West, an organization that documents and marks emigrant trails. Explorer William Nobles in 1852 pioneered the route connecting the Shasta County community of Shasta City with the established Applegate Trail near the Black Rock Desert. The trail crossed the Smoke Creek area, bringing emigrants into the Honey Lake Valley and the current site of Susanville. It continued across the mountains that are now part of the Lassen National Forest before terminating at Shasta City. Visitors can still see remnants of the original trail running parallel to the Smoke Creek Road northeast of Susanville, in Susanville’s Memorial Park, and in areas west of Susanville. Many trail segments are marked with Trails West signposts. Information and a trail map are available at https://www.blm.gov/visit/nobles-emigrant-trail. You can click here and watch the video over at YouTube. Posted by Jeremy on . Filed under Announcements, Local & Regional News. You can follow any responses to this entry through the RSS 2.0. Responses are currently closed, but you can trackback from your own site.